Science Fiction author Robert Heinlein is the latest inductee into the Hall of Famous Missourians. Heinlein was one of the most dominant and best-selling writers in the genre for several decades. He was also the first Science Fiction author to break into mainstream publications in the 1940’s, and won an Oscar for his movie “Destination Moon” in 1950. Kato also contends Heinlein’s work remains relevant today. “Even now, 28 years after his death, the royalties on his books exceed something like $300,000 a year”. Heinlein was known for blending realistic science into his readable writing style. Four of his works won the science fiction genre’s coveted Hugo Award. Among them were Double Star, Starship Troopers, Stranger In A Strange Land and The Moon Is A Harsh Mistress. Heinlein was born in Butler, Missouri in 1907 and raised in Kansas City. He was active as an author over portions of six decades until his death in 1988. Heinlein is the 46th inductee into the Hall of Famous Missourians, joining legends such as Mark Twain and Walt Disney. He’s only the second inductee selected by a public vote. 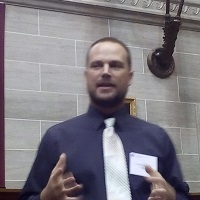 Inductees prior to 2013 were chosen by the Speaker of the Missouri House.